Our team has the expertise needed to safely and effectively clean just about any surface to make it look as good as new. We use only the safest and most effective washing methods in the industry. We are a locally grown business and ensure each customer 100% satisfaction. Call us today or fill out the free no obligation estimate form and let us show you why we are top rated. Proper preventative maintenance to every parking lot and garage create longevity and unnecessary repairs. Removal of all loose dirt and debris from surface area on a regular basis via curb blowing and industrial sweeping, your striping will last longer with less chipping and grinding. We will pressure wash oil spots, food stains, mud or hydraulic spills. Oils stains on concrete are unsightly, but with our highly effective removal techniques we can clean them up for you. What many don’t realize is that spilled oil in your parking garage can be tracked onto sidewalks and into business establishments, which may even create safety issues with possible slip and falls. Keep your lot clean and safe for others. Our team is ready to clean any size garage or lot you have! We clean all types of large parking structures. Concrete is an ideal environment for dirt mold and mildew. It is very porous, and those pores are a natural part of the curing process of the concrete as the water evaporates out of it. Over time, rain carries dirt, salt, and other contaminants into the concrete through those pores making it look old. To make matters worse, during the winter months, when water freezes, it expands by 9%, causing cracking, chipping, and pitting. Once in need of repair, a concrete slab for a patio, pool deck, or even driveway can cost thousands of dollars to replace. One way to avoid all of this inconvenience and save money, is by regularly maintenance. Allow our trained team of experts to help you. We will revive your pool deck, patio, and driveway in no time. Our high pressure spraying services will remove mold, dirt, and debris from the concrete and keep it looking fresh and clean. We can even remove any fungi and molds with our roof cleaning services. 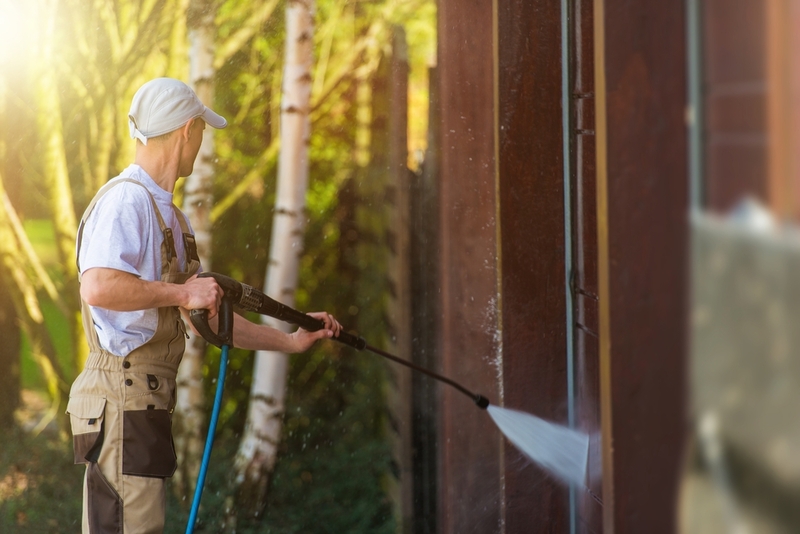 Contact our team today to create a regular cleaning maintenance schedule to keep your exterior in the clean state it deserves. If you find yourself outside scrubbing grease and oil stains with a toothbrush and baking soda, you’re working too hard and wasting too much time. Replace the war of trying to fight the stains with hiring a power washing service to get rid of the stains for you. Our stain removal service is quick and extremely efficient. We can attack and get rid of just about any stain you may have. We have a variety of detergents to use depending on your stain and a protocol of pressure to use, to give you the best results. Professional courteous service. These guys are the real deal. I've had pressure washing done before, but my property has never looked as good as when columbia brothers power washes our home. Great Company and amazing power washing results! The employees are very friendly and clean up after themselves. Very professional. Home looked great after the cleaning. I would definitely use them again. Columbia Brothers just did a great job of pressure cleaning my patio and driveway. I have hired them three times and will do it again. I started to try to remove some stains that we had on our concrete in our garage, and it was taking me forever. But thanks to columbia brothers power washing- they helped us clean them in no time! Should have called you sooner! I am beyond impressed with this company. They perform excellent services and are very polite! This company is the best around! They cleaned our parking garage quickly. They washed the sides removing graffiti, and cleaned up oil spills on the concrete. I will use them again!